In the fall of 2015, Trinity adopted an eight-day rotational schedule, which has provided an immediate positive impact on the daily lives of our students and teachers. The basic framework of the schedule follows an eight-day rotation: eight traditional class periods are spread out over eight instructional days, then the rotation begins again. Over those eight days, each course meets six times—with one longer period per day that a teacher may use for activities, science labs, projects or group work. A rotational schedule is not a block schedule, which has a much lower frequency of student/teacher contact. An eight-day rotational schedule gives students broader course selection while maintaining a high degree of frequency of teacher/student contact. The FAQ below covers in detail both schedule mechanics and the philosophy behind the changes. This FAQ will be enhanced as we receive questions from the community. The new Trinity schedule has provided a framework to create an even stronger, more collaborative community that maximizes opportunities for our students to discover their paths. Q. Why is Trinity moving to a new schedule? An integral part of our mission is to “challenge students to discover their paths… within a dynamic academic community.” It has become clear over several years, through our annual scheduling process and through interviews and surveys with every current student and teacher, that the rigidity of our current daily schedule is limiting our ability to deliver on that portion of our mission. Q. What was the process for choosing a new schedule? With the guidance of Independent School Management (ISM), an educational consulting group that has worked with hundreds of independent schools, we surveyed every student and teacher, and interviewed a cross-section of administration, faculty, parents and students. The results reinforced things that we already do extremely well, such as Morning Meeting, Late-Start Monday, and the way we approach the creation of community. The final ISM report stated that a new schedule would help us better fulfill our mission. After the ISM schedule recommendation process, a committee of faculty and administration evaluated the proposals and selected the best schedule framework for Trinity, keeping issues of school culture and community at the forefront. We examined many facets of our school day including calendar, community, logistics and how the schedule would serve the academic, extracurricular and athletic components of our program. Q. What main objectives does the new schedule accomplish? Q. How does an 8-day rotational schedule work? The basic framework of the new schedule follows an eight-day rotation: eight traditional class periods (aka “carriers”) are spread out over eight instructional days, then the rotation begins again. Over those eight days, each course will meet six times — with one longer period per day that a teacher may use for activities, science lab, project or group work. A rotational schedule is not a block schedule, which has a much lower frequency of student-teacher contact. An eight-day rotational schedule will give our students course selection while maintaining a high degree of frequency of student-teacher contact. A schedule that rotates changes the order of classes from day to day. In a traditional schedule, a class might always meet just before lunch, whereas in a rotational schedule the meeting time would rotate to a different time each day. For example, a math class might meet at 8 a.m. on the first day, 9 a.m. on the second, 10 a.m. on the third, and so on. We see this as a benefit because students and teachers perform differently at different times of the day. One distinct advantage of a rotational schedule for Trinity is that it will spread out the impact of athletic early-dismissal times, which disproportionately affect the last period of the day. A typical day starts with one of the most important parts of every Titan’s life: Morning Meeting, followed by six 50-minute class periods, one discovery period and a Lunch Period. Each student will transition through six class periods each day (instead of the current seven). Due to the rotation, students will find themselves engaged in the same number of classes as the traditional seven-period day over the course of the rotation, but will have fewer daily classes and more time to complete assignments, collaborate with fellow students and work on projects. Additionally, the dedicated discovery period allows for club meetings and time to ask teachers questions. Lunch truly becomes a time for lunch. Tuesday through Friday follow the same structure each day. Monday is the only day with an alternate schedule to allow for early-morning faculty collaboration time and a midday Chapel period. Q. How will the new schedule impact Trinity’s curriculum? 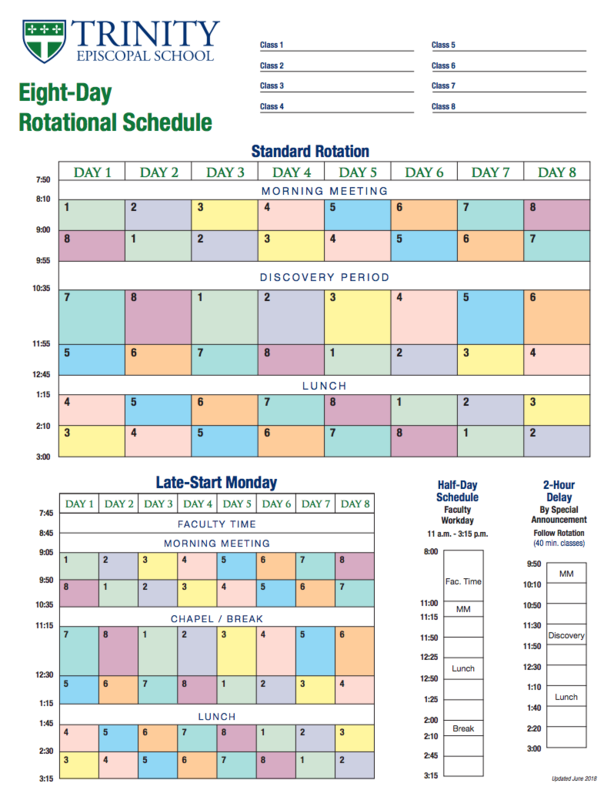 By adding a single, expanded 80-minute period to each rotation, the rotational schedule allows teachers to use a greater variety of teaching techniques. Projects, inquiry-based activities and labs frequently are better suited to a 50-minute period or an 80-minute period rather than a short 47-minute class. Q. What is the discovery period? Following the first two class periods, four days per week (Tuesday—Friday), from 9:55 a.m. to 10:40 a.m., the discovery period is intended to allow greater collaborative time for students and faculty alike. Students may meet with teachers during their office hours for extra help, hold club meetings and collaborate with each other on academic and extracurricular projects. This 45-minute period relieves some of the burden of trying to fit everything into the lunch time frame and gives all students a common time in which they can schedule meetings and interact with their peers as well as their teachers, coaches, advisors and administrators. Q. What happened to Tutorial? How can a student get individual attention from a teacher? Teachers will be available to meet with students and answer questions during the discovery period. Moving this time from the end of the day to the middle of the day helps to ensure that all students have ample access to teachers. This collaborative inquiry has long been an important part of how students can enrich their classroom experience, gain extra help and prepare for upcoming assignments at their own pace—and we believe the new midday placement will allow for teachers to be more available than ever. Q. What will the impact be on extra-curricular activities? The discovery period allows students to engage in club meetings and focus on the club activities and planning to a much greater extent than was previously possible. Whereas students have traditionally been forced to squeeze their engagement in club, student government and other activities into a brief lunchtime period, the new schedule separates these activities from time devoted specifically to eating lunch. Q. How will this schedule affect the course-selection and scheduling process for each student? The new schedule will make course selection easier, because each student will have even more options available than before. Q. How will IB classes be affected? The addition of an extra carrier period (eight instead of seven) gives our IB students and students taking IB classes more flexibility with scheduling and creates fewer conflicts in the scheduling process. One of the core goals identified by our 2011 IB Self-Study was to improve scheduling of IB students in the junior and senior year. A rotational schedule opens up more options for IB students by spreading study halls and labs more evenly throughout each rotation. IB students will see advantages to this system immediately with more balanced workloads. Any rising IB junior or senior concerned about his or her schedule next year is encouraged to contact IB Program Coordinator Marti Truman, at martitruman@trinityes.org, for review. Q. When will bells ring? Bells will ring at the end of a period, signifying a time to move directly to the next period. Q. How will exams be affected? By reducing the number of formal exam days during the year from ten to four, we will be able to devote more time to instruction. Q. What will the impact be on a student’s workload? In evaluating a new schedule, a core consideration was to offer students greater opportunity while simultaneously reducing stress. The new schedule achieves both of these objectives and allows students a more efficient way to manage their academic, extracurricular and athletic commitments. Q. How will you make sure that students don’t have too many tests/projects due on the same day? One of our important goals is to manage student workloads more mindfully. We aim for a student to have no more than two tests or big projects due on any one day. To that end, coordinating test days and project due dates by departments on the eight days of the rotation will allow us to balance student workflows. In the new schedule, each department will have no more than two days per rotation to assign tests or projects due. Q. What will lunch be like in the new schedule? Lunch will still be 30 minutes long, but it will occur later in the day (12:50 p.m.). There will be breaks for students to have snacks throughout the school day. We will continue to offer the option of ordering lunch from outside vendors. Students will be able to devote their full attention to eating, enjoying one another’s company and the musical performances at Pach’s Place. Q. Will seniors be able to sign out during discovery period? No. The discovery period is as much a part of our curriculum as classes are each day. Extracurricular experiences allow students to explore new ideas, learn what it means to work with and manage groups with a common aim, take on leadership opportunities, and apply their knowledge in new and creative ways. Opportunity to meet with teachers is also an important part of the discovery period each day. Senior sign outs will occur during a designated study hall period which they will choose ahead of time. The students must be on honor roll, have demonstrated good attendance and conduct and have parents give consent before being permitted to sign out of campus for one period only. Q. What happens to the rotation if we have a snow day? The rotation continues, skipping that particular day. A rotational schedule is dependent upon cycling through a quarter, semester or year with a set number of rotations. Q. How do we know what day it is in the rotation? Students will have a complete and detailed graphical representation of each day’s schedule available to them in PowerSchool. Additionally, the daily rotation will be posted throughout campus. Q. Is this a “block” schedule? Did Trinity consider a block schedule? No. Across all of our extensive surveys, interviews and research, we heard consistently that a block schedule would not be a good fit for Trinity. Whereas block schedules often allow only one or two class meetings per week in a given subject, students in an eight-day rotational schedule meet more frequently with teachers—essentially following a pattern of three days on, one day off. In a rotational schedule students experience one long period of 80 minutes during each eight day rotation and the other periods are of 50 minutes each except on Monday, where the periods are slightly shorter. Q. Will the new format affect the number of credits required for graduation? No. Students will sign up for the same number of classes that they have under our traditional seven period day. The credits for graduation will not be changed as a result of this schedule. Q. How do semester or yearlong courses translate into the rotational system? Students will experience their yearlong and elective classes in much the same way as they do now. Fall electives will run from August until January and spring electives from January until May. Yearlong courses will meet all year. Q. How do college admission offices consider schedules? The daily schedule a high school uses has no bearing on college admissions. Q. How will sports practices and contests be affected? School will end at 3:00 p.m. Tuesday through Friday, which will allow sports practices to begin at 3:15 p.m. (On Mondays, following a 3:15 p.m. dismissal, practices will begin at 3:30 p.m.) A consistent end-of-school time will make coordinating practices simpler for off-campus sports. Games will be scheduled as normal.